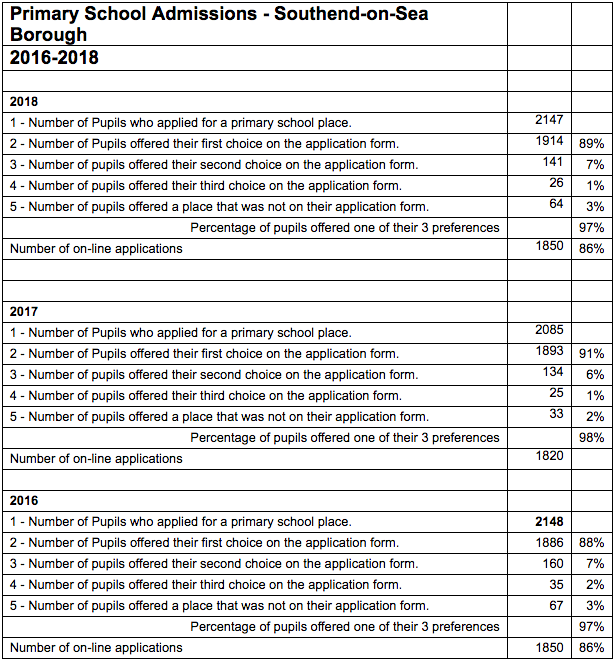 Nearly nine in ten Southend-on-Sea children will start primary school in September 2018 at their first choice primary school, and almost all at one of their top three preferences. The data on primary school allocations has been announced by the Council as part of ‘national offer day’, with parents and children finding out what school their children will be starting in September. Out of 2147 applications, 1914 (89%) received an offer for their first preference, 141 (7%) their second preference, and 26 (1%) an offer for their third choice. Sixty-four (3%) received an alternative offer. Brin Martin, Director of Learning at Southend-on-Sea Borough Council, said: “I am delighted that 89% of local primary school children will be attending their first choice primary school come September, with 97% gaining entry to one of their top three choices. We received 62 more applications (2147) than in 2017 (2085), which was a low birth year. We have still managed to offer 89% of parents their first choice school. The council recently embarked on a multi-million pound primary school expansion programme to deliver new pupil places by September 2014 and September 2015 and is now planning a secondary school expansion programme to deliver 10 to 11 new forms of entry in total by September 2019, with 5-6 by September 2018.